This long classic burgundy red prom dress is sure to be worn again and again. A timeless formal dress with simple elegance will win over every time. 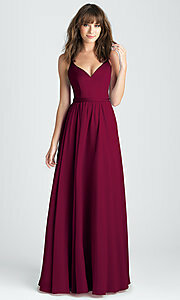 This long burgundy red evening dress has a structured v-neck bodice with an enticing low v-back. A shimmering satin band enhances the natural waistline and crowns the beautiful chiffon skirt that flows gracefully to a floor length. Whether you wear this burgundy red prom dress to winter formals or prom, it is sure to be a worthy addition to your formal-wear wardrobe.